Yes Virginia we have outfits for you as well! Maneco has several traditional Mrs. Claus outfits including our standard outfit which inlcudes a beautiful full length dress, mop style hat & apron - all trimmed in lace. 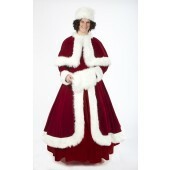 We also have our Mrs. Claus Christmas Charmer dress. Just the thing for a little more contemporary Mrs. Claus.